Tofino Time - Tofino Article: Sing for your Life! How many times have you heard some say - or said yourself - “I can’t sing”? “ Balderdash!” says Shivon Robinsong. She says anyone can learn to sing, and she should know. Shivon is founder and co-director of Victoria’s Getting’ Higher Choir, a no-audition community choir that has grown to over 300 members, many who once thought of themselves as “non-singers”. Shivon conducted a marvelous Sing For Your Life! workshop in the area last year. Not wanting to stop singing, people formed soundwaves choir, which has since grown considerably and meets regularly. 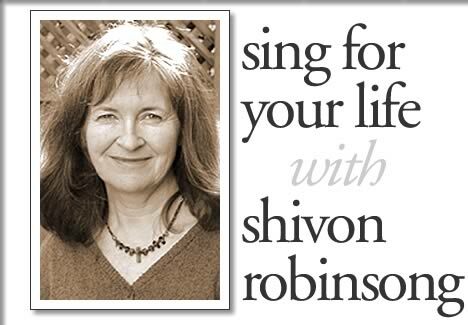 By popular demand, Shivon returns for another Sing for Your Life! workshop Saturday & Sunday, June 5th and 6th at Long Beach Lodge, from 10am - 5pm. Sing for Your Life! workshop will focus on singing songs from various traditions that are easy to learn, fun and uplifting to sing, in glorious 3 and 4 part harmonies. Fee is $67 for both days, $40 for one. A limited number of “pay as you can” registrations is available.